Overview: Our team focuses on Subseasonal-to-Seasonal (S2S) prediction of atmospheric river activity over the western U.S. region. S2S lead times of 2 weeks to 2 months represent critical decision-making windows for water resource managers and other end-users of weather and climate information in the applications community. With support from the California Department of Water Resources (DWR) and in partnership with the NASA Jet Propulsion Laboratory, our team has published peer-reviewed literature on global atmospheric river subseasonal prediction skill and developed experimental week-3 dynamical and statistical model outlooks of AR activity. Key Results: CW3E has developed a week-2 and week-3 experimental atmospheric river (AR) outlook that incorporates probabilistic forecasts from dynamical models run at leading forecasting centers, including the U.S. National Centers for Environmental Prediction (NCEP), the European Centre for Medium-Range Weather Forecasts (ECMWF), and the Environment and Climate Change Canada (ECCC). It also includes statistical forecasts made from the current weather and climate conditions. CW3E is continuing to asses the skill of the different forecast products at different lead times. The results from two studies lead by CW3E researcher, Mike DeFlorio, are highlighted below. 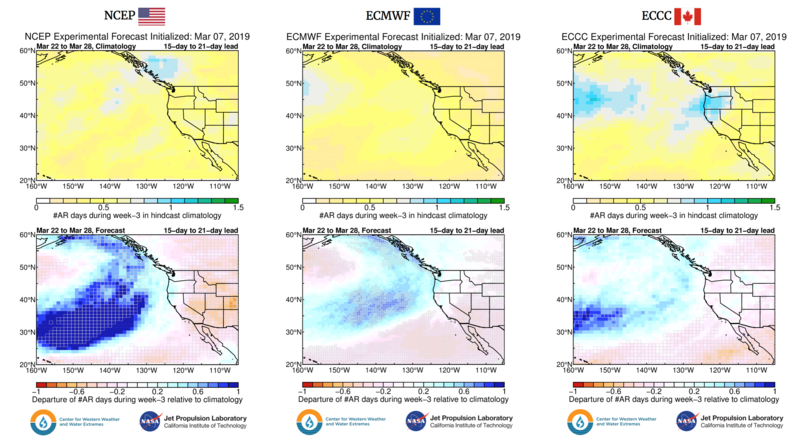 Figure 1: Sample multi-model experimental outlook from March 7, 2019 forecast, as displayed on the CW3E Week-3 protected website for the NCEP, ECMWF, and ECCC forecast systems. The top row shows climatological values of AR occurrence in each model’s hindcast record for the week-3 verification period. The bottom row shows the departure of the AR occurrence forecast for that same verification period (forecast minus top panel climatology). For this row, blue values represent higher than average AR activity predicted during week-3; red values represent lower than average AR activity predicted during week-3. Grey rectangles surround grid cells where >75% of forecast ensemble members agree on the sign of the AR occurrence anomaly with respect to climatology. These regions can be interpreted as having higher confidence in their prediction of week-3 AR occurrence. DeFlorio et al. (2018a) evaluated the global prediction skill of the ECMWF hindcast system for the occurrence of atmospheric rivers (ARs). Figure 2 shows that hindcasts of AR occurrence over the North Pacific/Western U.S. region have significant skill above climatology at lead times of one and two weeks, have slightly more skill than climatology at week-3 lead time. 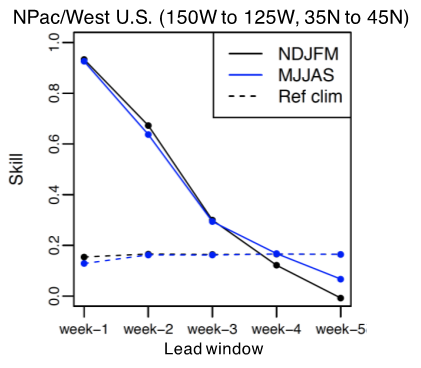 Figure 2: Number of AR days per week (AR1wk occurrence) area-mean anomaly forecast skill in the ECMWF hindcast system as a function of lead window over the North Pacific/Western U.S. region in NDJFM (black) and MJJAS (blue) averaged during the period 1996-2015. The forecast skill is compared against a reference climatological forecast from ERA-I (dashed lines), defined as the correlation of the sum of the observed AR1wk occurrence anomaly time series and observed AR1wk occurrence monthly climatology with the observed AR1wk occurrence monthly climatology. From DeFlorio et al. (2018b). DeFlorio et al. (2018b) also showed that prediction skill of AR occurrence at various S2S lead times in the ECMWF hindcast system is increased when hindcasts are initialized during certain phases of the Madden Julian Oscillation (MJO) and other modes of climate variability. 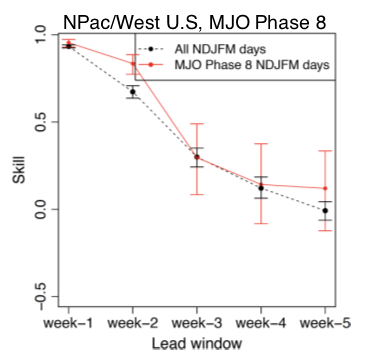 Figure 3 shows that hindcasts which are initialized during phase 8 of the MJO are associated with more skillful prediction of AR occurrence over the North Pacific/Western U.S. region 8-14 days later (week-2 lead time). Understanding these “forecasts of opportunity” when S2S prediction skill may be higher than the average prediction skill is important for weather forecasters and users of these extended range forecasts. Figure 3: Composite forecast skill of AR1wk occurrence (number of AR days per week) anomalies during particular MJO phases (red) over the North Pacific/Western U.S. region in NDJFM during the period 1996-2015 in the ECMWF hindcast system. Mode and region combinations with large (~95% confidence) skill differences between particular MJO phases and the all-days case are shown. Red and black horizontal lines represent 95% and 5% quantile values for a bootstrapped distribution of the particular MJO phase and all days case, respectively, re-sampled 1000 times with replacement. (Figure 13b from DeFlorio et al. (2018b)). What’s next: The next steps for our team include submission and eventual publication of peer-reviewed journal articles on S2S hindcast skill assessment of AR activity (DeFlorio et al. 2019, in preparation) and AR vs. non-AR IVT (Zhang et al. 2019, in preparation) during week-3 over the western U.S. We also intend to further develop and refine our S2S week-3 AR experimental outlook tools, and plan to explore post-processing and machine learning application to ensemble S2S prediction of precipitation. DeFlorio, M.J., D.E. Waliser, B. Guan, D.A. Lavers, F.M. Ralph, and F. Vitart, (2018a), Global Assessment of Atmospheric River Prediction Skill., J. Hydrometeor., 19, 409-426. https://doi.org/10.1175/JHM-D-17-0135.1 . DeFlorio, M. J., D. E. Waliser, B. Guan, F. M. Ralph, and F. Vitart (2018b), Global evaluation of atmospheric river subseasonal prediction skill, Climate Dynamics, 54, 3039. doi:10.1007/s00382-018-4309-x. DeFlorio, M. J., D. E. Waliser, F. M. Ralph, L. Delle Monache, A. Goodman, B. Guan, A. C. Subramanian, S. Asharaf, Z. Zhang, A. Gershunov, K. Guirguis, F. Vitart, H. Lin, and A. Kumar (2019), Experimental Subseasonal Forecasting of Atmospheric River Activity over the Western U.S., in preparation. Zhang, Z., M. J. DeFlorio, A. C. Subramanian, D. E. Waliser, F. M. Ralph, L. Delle Monache, A. Goodman, and B. Guan (2019), Multi-model hindcast skill assessment of AR-related IVT over the western U.S., in preparation.